For the ninth and final sampling during the Showdown our judges experienced Eric Johnson’s Tennessee Fiery Apple and The Swaderita at Chub’s Pub. We were then off to Sidestreet to try Mistelle Stein’s Russian Tea and Eddie Gonzalez’s Afterburner. Soon we found ourselves at Pounds where Kory Wiler introduced us to The Hoser and Peach Kuchen. The last stop in the showdown brought us to sample The Dead Elvis and The Distiller’s Reserve from award-winning mixologist Elijah Larson at Proof. Chub’s Pub, located at 421 University Dr. N, is a neighborhood staple for North Fargo residents and Bison fans alike. With Bison Saturday specials, off sale, Pizza Corner pizzas and a cozy atmosphere, one could see why Chub’s has been one of Fargo’s favorite sports bars. 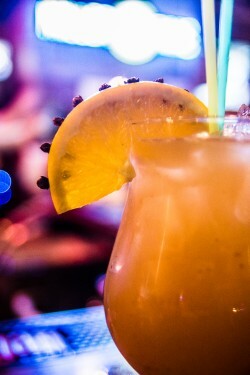 The Tennessee Fiery Apple involves Jack Fire, Apple Pucker and a splash of cranberry juice. According to Johnson, Jack Fire has been a hot seller (pardon the pun) for Chub’s, so he decided to play around with it to see how various flavor combinations would work. The Swaderita contains Patron Silver, Grand Marnier and fresh squeezed lime juice. It first came to be when one of Chub’s regulars requested a deluxe margarita. Naturally, what the customer wants the customer gets. Wade used top-shelf ingredients and a little TLC, thus the Swaderita was born. Sidestreet recently relocated to 404 Fourth Ave. N., in downtown Fargo. The new location features the same menu that we all know and love, chock-full of appetizers, burgers, pizzas, sandwiches and much, much more. Just add on-site gaming, a larger stage area/dance floor and 50 beers on tap and it’s almost like you’re reunited with an old friend -- but with better toys. 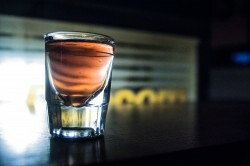 Afterburner is a mixture of Watermelon Pucker, peach schnapps, a splash of sour and a dash of Tabasco sauce. Don’t let the Tabasco sauce throw you off though. “It’s an Afterburner, not a destroyer,” Gonzalez says, adding that the spice can be altered to the customer’s liking. 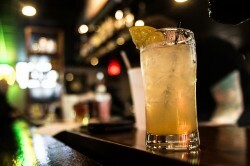 He says that he has tried variations of the Afterburner at other bars, but he has modified and improved the recipe. The inspiration for it is one of his favorite confections from Mexico, which happens to be a watermelon-flavored sucker covered in chili powder. The Russian Tea is a new take on an old favorite and pays a bit of an homage to a recipe from Stein’s grandmother. 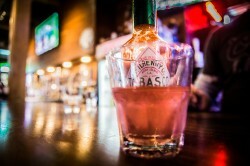 Granted, the original mixture was non-alcoholic, but that is where the new take comes in. The original recipe involved Lipton tea and Tang. Mistelle’s version uses Jeremiah Weed and Coldcock American Herbal Whiskey, with macerated citrus, Luxardo cherries, spiced cherry bitters, clove syrup, a splash of soda and a clove-studded orange slice as garnish. Pounds is located at 612 First Ave. N. and is a fairly recent addition to downtown Fargo. It has a hip, lively atmosphere -- the walls of the bar are covered in chalk paint, which adds to an all-inclusive atmosphere. The menu includes burgers, sandwiches, greens, dessert, soups, sides and snacks. Let us not forget the drinks: There is a full cocktail and martini menu, variety craft beers on tap, and nothing but the finest of 40 ounce malt liquors. Peach Kuchen is a bit of a shout-out to Wiler’s German heritage. It tastes much like its namesake, which is a custard-based, not-too-sweet dessert. 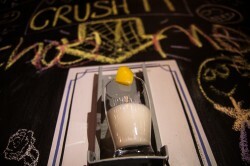 The shot involves Rumchata, peach schnapps, a bit of pineapple juice and garnished with a peach. According to Wiler this drink is “a diss on Canadians.” It contains maple syrup, Captain Morgan and housemade apple cider, which is deliciously spiced with cinnamon, nutmeg and coriander. A squeezed lemon adds a citrus kick, and the finishing touch involves a dusting of cinnamon to add a bit of seasonal flavor. Proof is located at 414 Fourth Ave. N. in Fargo and is open Thursday through Saturday. It is a new addition to downtown Fargo, and ironically enough it is located in what was once the municipal courthouse -- the copper still has been christened “The Judge.” Not only does it house a distillery in which fine vodka, gin and whiskey are produced, but it also features a full menu, in which small plates and tapas are served. They also feature artisan cocktails, with juice squeezed fresh daily. The bar was built in 1890 in Ray, N.D. When that establishment closed it was then relocated to The Down Under in Grand Forks, and after a lot of TLC the bar was restored to its former lustre. Proof was recently awarded two Gold Medals from the Great American Spirits Festival in Portland, Ore. -- one for Minions Old Fashioned Cocktail and another for Minions Barreled Gin. “The Dead Elvis” pays homage to none other than the King’s, aka Elvis Presley’s, favorite sandwich and involves peanut butter, jelly, banana and bacon. We were greeted with chef Judd fishing jelly globules from a solution involving soy lecithin emulsifiers and a bit of molecular gastronomy. The end result was a jelly-vodka mixture with an egg yolk texture. Chef Judd explained that the emulsification of the globules was enough of a procedure, but once alcohol was added it made the process a bit more complex. The second facet to the shot involved pureed peanut butter and bananas combined with their creme liqueur. The mixture was then aerated with a fish pump to create a lighter, airy texture. The third step involved a cotton candy machine: Larson steeped bacon in sugar for three days and then made cotton candy from the bacon sugar and wound it around a bacon stick. 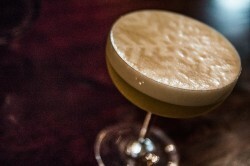 “The Distiller’s Reserve Cocktail” is a play on the gin sour. 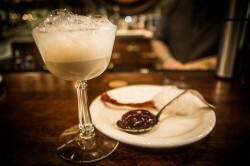 Not only does it contain Proof’s award-winning gin but also fig, simple syrup, reduced honey, egg white and house bitters. Each drink was given a “dry shake” and shaken individually due to the finicky nature of the egg whites. Larson explained that this step added a velvety texture and aided in emulsifying the egg white. 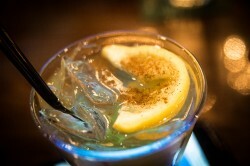 Each coupe glass was then given a house bourbon rinse and the mixture was added to a lemon-orange juice mix. He then embellished the “head” of the cocktail by spraying the house bitters through a snowflake stencil -- just to add a little bit of Christmas cheer.